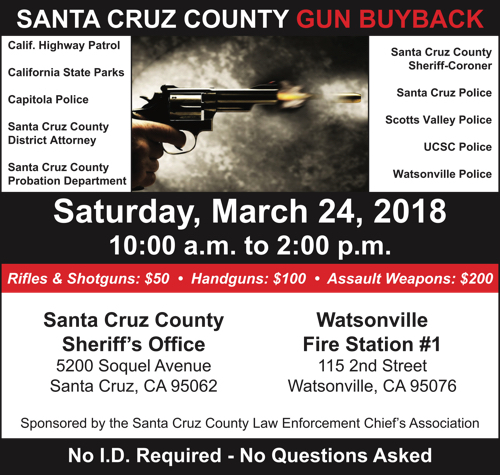 Santa Cruz County residents can sell their unwanted firearms as part of a gun buyback sponsored by the Santa Cruz County Law Enforcement Chief’s Association. The association will offer $50 for rifles and shotguns, $100 for handguns, and $200 for assault weapons. No ID is required and no questions will be asked. The buybacks will be held from 10 a.m. to 2 p.m. at the Santa Cruz County Sheriff’s Office, 5200 Soquel Ave., Santa Cruz, and the Watsonville Fire Station No. 1, 115 Second St., Watsonville. The chief’s association includes the California Highway Patrol, California State Parks, Capitola Police Department, Santa Cruz County District Attorney, Santa Cruz County Probation Department, Santa Cruz County Sheriff-Coroner, Santa Cruz Police Department, Scotts Valley Police Department, UC Santa Cruz Police Department, and Watsonville Police Department.